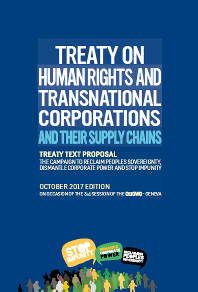 2018 WILL BE A DECISIVE YEAR FOR THE BINDING TREATY ON TRANSNATIONAL CORPORATIONS AND HUMAN RIGHTS! In the city of Geneva: in coordination with the local University Students Union (Conférence Universitaire des Associations d’Etudiant/Es – CUAE), with local organisations and movements, we’ll co-organise 3 Public Events at the University of Geneva and the Maison des Associations, and participate in a Public Demonstration for Climate Justice. 3 Pings/Trackbacks for "Save the Date! Week of Peoples Mobilisation (13-20 October 2018, Geneva) #BindingTreaty"